It was a wild afternoon at Hadlock, with the two teams combining for 21 runs, including 19 in the first five innings. Receiving the brunt of the Sea Dogs assault was old friend Nate Reed, who pitched for Portland (as well as Salem) back in 2014. It's unsurprising, given their recent play, that Michael Chavis and Jeremy Barfield both homered in the effort. Chavis went deep in the first, his 27th of the year between two levels, and added a double and a walk. Barfield blasted what proved to be the decisive blow with a solo shot in the eighth that broke a 10-10 deadlock. He now has 19 homers on the year despite not having even signed until late May. He's been especially dominant recently, with eight homers in his last 11 games. Henry Urrutia added a third-inning grand slam. After a tough start by Teddy Stankiewicz, the bullpen trio of Josh Smith, Taylor Grover, and Bobby Poyner surrendered just one run in 5 2/3. Rain would not cooperate with the opener of Salem's set in Myrtle Beach. They'll try again as part of a doubleheader on Friday. The Drive got a dominant performance from Daniel Gonzalez (pictured, right) to come away with the win on Friday. The righty went seven shutout innings, scattering four hits and striking out six while walking only one. 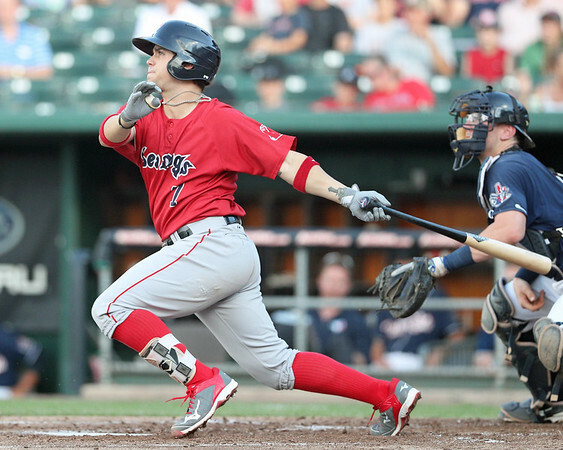 At the plate, Brett Netzer was 2 for 4 with a run scored, making him 3 for 8 in two games since his promotion from Lowell. Roldani Baldwin clubbed his organization and South Atlantic League-leading 29th double, his 12th in his last 24 games. After his pro debut was put on hold due to Wednesday's rain out, fourth-round pick Jake Thompson took the mound to start yesterday's doubleheader. The right-hander allowed a pair of runs on three hits in his lone inning of work. SoxProspects.com Director of Scouting Ian Cundall was on location, and he noted that all three hits came on soft contact, and that Thompson reached 96 with his fastball and showed some command of both the change and slider. Most impressive, per Cundall, was a four-pitch strikeout of third overall pick Brendan McKay. The Spinners earned the split in the nightcap, with a solid outing coming from starter Nick Duron. The 21-year-old righty allowed just one unearned run in five innings of work, walking one and striking out a pair. His fastball sat 92 to 94 and touched 95, and he showed feel for the change, according to Cundall. Devon Fisher pitched two scoreless frames out of the bullpen to get credit for the win. Alexander Martinez entered the contest 0 for 12 since his promotion from the Gulf Coast League, but he turned things around on Thursday night. He led the offense, going 2 for 2 with a double, triple, a walk, and a run scored. It was a tough walk-off loss for the GCL Sox, who had come back to tie the contest with a pair of runs in the eighth. Rio Gomez, Boston's 36th-round pick out of Arizona, made his first start after appearing seven times out of the bullpen. He struck out five while surrendering just two hits in four shutout innings of work. Gomez has allowed just two earned runs in 21 innings as a pro (0.86 ERA), and he sports a 0.76 WHIP. Two of the Sox five hits came off the bat of Everlouis Lozada, who has multi-hit games in four of his last six starts. The Sox were victims of the new extra-inning rules in their 10th-inning loss. Starter Yasel Santana went four shutout innings, striking out four without issuing a walk and allowing just two hits. The offense managed only five hits, with a double by Rafael Rincones the only one of the extra-base variety. It was the 10th double of the year for Rincones, who also walked twice. Willis Figueroa also had a pair of walks, as he maintains a .520 on-base percentage. Player of the Day: Daniel Gonzalez has been a jack-of-all-trades on the mound between Greenville and Salem. He earned his 10th win of the season across the two levels on Thursday with his best outing of the year. The 21-year-old out of Venezuela started all four games when he's been with Salem, but he has largely worked out of the Greenville bullpen--yesterday was just his fifth start against 14 relief appearances. Between the two stops, Gonzalez has struck out 83 batters while walking only 26, on his was to an impressive 2.92 ERA.